I'm not one to knock soccer in the USA, in fact I've championed it on these pages in many an article about the MLS but this is just ridiculous isn't it? 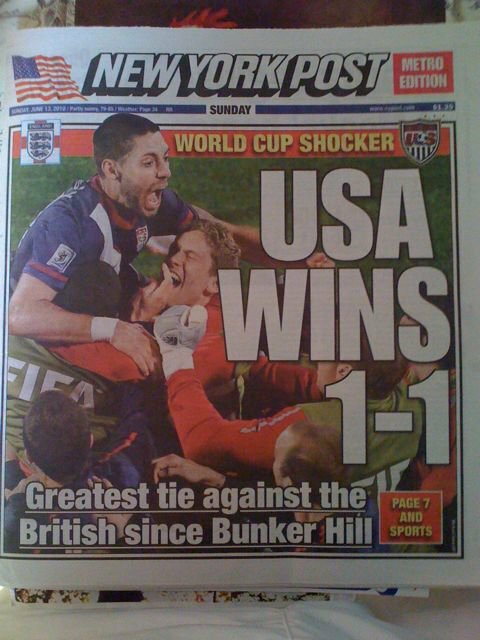 The New York Post - not normally famed for their soccer coverage - stick up a front page declaring a 1-1 win for the USA. Radio rental? Bonkers? Actually, neither. Evidently, the headline is a play on the a 1968 headline from the Havard student newspaper after Havard came from behind in an American football game against rivals Yale "Harvard beats Yale 29-29". So they've not quite taken leave of their senses although the do seem to think they were playing Britain and not England. Whatever, well played USA! USA! USA! 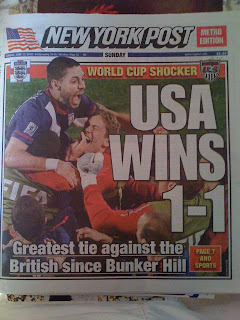 and England weren't quite as bad as everyone is making out either. A draw was a fair result. Onwards and upwards. watched the game in Timisoara in Romania. Not speaking any Romanian or reading any of our partisan press post match I thought that England played okay. Not great, but okay. Do worry a tad about our defence though. Oh and our abilty to score. And the midfield.. Where was Lampard hiding? Other than that still good to meet Espagna in the final. Umm, did i mention goal keeping? What they lack in football vocab, they make up for in tabloidese.